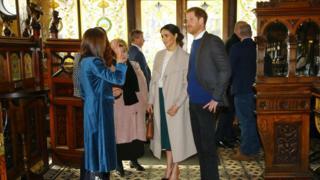 Prince Harry and his fiancée, Meghan Markle are at the Crown Bar in Belfast as part of a visit to Northern Ireland. The couple waved to the crowds before heading inside, where they will meet bar staff, local musicians and have a private lunch. The trip is one of a string of public engagements ahead of their wedding on 19 May. They will meet members of the public on Belfast’s Great Victoria Street on Friday afternoon. The Crown Liquor Saloon is one of Belfast’s most iconic buildings and is owned by the National Trust. Their tour began at the Eikon Centre on Friday morning, where they were shown the work of Amazing the Space. The initiative was launched by Prince Harry in September 2017 and empowers young people in Northern Ireland to become ambassadors for peace in their communities. Later they will travel to the Belfast campus of Northern Ireland’s next generation science park, Catalyst Inc, to meet some of Northern Ireland’s brightest young entrepreneurs and innovators. The trip is part of the couple’s public engagements in the run-up to their wedding on 19 May. It is their first official, joint visit to Northern Ireland. Invitations to their wedding were issued on Thursday.